You all are going to start wondering if I actually watch my children when we are out and about. The answer is a resounding 'yes, I do'! However, they can be here one minute and gone the next. This is the nature of kids, I am finding out. Today is 'park day' for us. During the nicer weather, our homeschool group schedules Wednesdays to meet at the park and let the kids play while we Mom's get some adult conversation. Well, I say adult conversation loosely...it's usually in between bouts of chasing after kids, pushing them on the swing, kissing hurt fingers, toes and heads, and the occasional, Mom, he pushed me. The kids had a great time playing and being outside at the park. Aaron found the muddiest mudhole there was in the park and decided to jump in it. After getting after him trying my hardest to get him to understand that mud and the car didn't go hand in hand and that maybe he should find something else to do, I walked to the bench to gather up the coats and say our goodbye's. As I was finishing up my conversation with the other families that were there, I began to look for Aaron but he was no where to be found. Of course, a bit of panic started settling in. We called for him but no answer. Finally, Brad heard a little cry and started heading in the direction it was coming in. What do you suppose was making that little cry from the very back of the park? A little boy sitting down just waiting for someone to come find him! I am so glad we found him and that he was just fine other than a little scared. After my marathon type sprint to the very back of the park giving up my love for oxygen, I realize that perhaps I need to up my exercise intake so that I'm trained and ready to fall into Olympic running speed whenever the need arises since this seems to be the 'norm' for us lately. I previously posted a blog on my addiction of video gaming. Since my 'secret' has come out of the closet, I have decided to share a little bit more of my addiction. Now as I find myself fighting gnolls and naga's with my dual wield abilities, my 'Screaming Dagger' and 'Hellfire skiver' allow me to kick some serious petukus. Together my husband and I can conquer Hellfire peninsula and beyond. As good ol' 'Martha' says...Video games, It's a very good thing! Have you ever had something happen to you that set your heart to soaring above the clouds? Have you ever had the urge to do a happy dance because something so wonderful has happened? Have you ever grabbed hold of your child's hand and jumped up and down repeatedly until you both were laughing so hard you fell over? These very things happened to me today! Our son who is the middle child, who has had a bit of emotional trauma since his sister was born ten months ago taking away much needed attention and who is already very dramatic in personality, has entered day five of pooping in the toilet! This makes me a very happy mama. She squeals with delight when she is called to the restroom to be shown the surprise that her number three son has to show her. 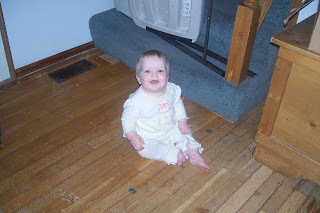 She has been known recently to dance excitedly around the house singing a song. She has also been seen jumping up and down yelling 'yeah, Ryan'....you are the man! When I asked him what changed his mind about going in the toilet, his response was simply this.....sometimes, Mom, a brain just has to change. My response:...for now...I'm enjoying the moment. He has been rewarded with his favorite treat...a medium-sized slurpee from our friendly neighborhood 7-eleven. However, I must ask myself, how long I'm willing to go along with the slurpee a day keeps the poop in the toilet way of thinking. Then, I remember just a week ago, how much I running upstairs to do the not-so-silent scream into my pillow when he wasn't using the toilet. I could potentially be willing to run to 7-eleven for a very long time. It's worth it, my friends! Very, very worth it! All of the children have found all this celebration that is exuding from my heart to be entirely to hysterical for them. 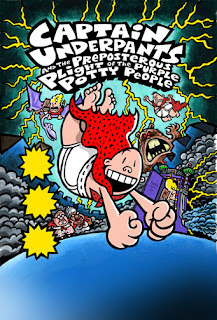 My oldest, who is a fan of the 'Captain Underpants' books thought that he would share with me some insightful information from Chapter two of the "Captain Underpants and the Preposterous Plight of the Purple Potty People." It's the same way with potty training: Most adults spend the first few years of a child's life cheerfully discussing pee and poopies, and how important it is to learn to put your pee-pee and poo-poo in the potty like big people do. But once children have mastered the art of toilet training, they are immediately forbidden to ever talk about poop, pee, toilets, and other bathroom-related subjects again. Such things are suddenly considered rude and vulgar, and are no longer rewarded with praise and cookies and juice boxes. You are probably wondering, why would adults do that? Why would they encourage something one day discourage it the next? The only answer I can think of is that adults are totally bonkers and should probably be avoided at all times. As I read the above mentioned chapter, I thought how amusing it is to have your children bring you a ridiculous book that actually has a bit of wisdom.....perhaps us adults are bonkers but it's the children who have helped us become what we are. This afternoon, I heard Grace running for the stairs asking everyone most urgently who helped Kara, who is now ten months old, up the stairs to the landing. Everyone that she interrogated promptly answered that it was not them. The incident was a little unsettling as she could have fallen down and I wanted to make sure her pesky brothers understood the cause and effect of the whole situation. One by one, I had a little heart to heart with. Again, the same response....it wasn't them. I even made them pinky swear that they were telling the truth....but still, they stuck to their story. Hmmmm....I thought to myself. 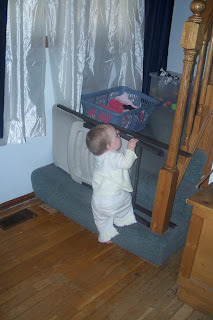 Could it possibly be that my little sweet girl who is only ten months old have the ability it climb the stairs herself? So I set out to catch her at her game. I sat on the stairs and called her by name. 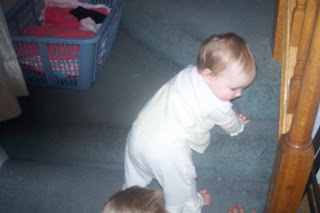 She came quickly crawling to the stairs and made her way up the landing without much effort. So then I put up a chair to block her from continuing on with her antics but do you know what she did next? She grabbed hold of the chair, brought herself up to the step and began hanging there contemplating her next move to get through the blockade. As she hung there, doing a few chin ups to get her muscles warmed up for leaping on over the chair, she let go landing on her cute little 'petukus' with this wide eyed look of what just happened, mama? You little sneaky sneaker, I thought to myself. What else do you have up your sleeve to do next that you are keeping hidden from me. Only time will tell because I'm sure she will not give up her secrets! My husband went in a couple times this past week to get his liver enzyme levels checked. He is still feeling quite lousy and in pain. The doctor called him on Thursday evening to let him know that the enzyme levels were still coming down, although, very slowly. Saturday evening, he got another call from the doctor telling him that she was concerned about the pain he was still having and that she wanted him to talk to a surgeon on Monday. She said they may have to do a liver biopsy. My mind began to go in all different directions. I am too young to be a widow. As I was letting fear take over, I began to wonder why the heck a doctor would tell you that so that you have two days to fret and worry. Why can't they just call you on Monday morning and tell you to come in to the office a hour later or at least have weekend appointments available. If I was a doctor, I certainly wouldn't want my patients fretting any more than necessary. The long, agonizingly long weekend finally came to a close and Monday arrived. The appointment time came and went. Finally, the verdict was out. The surgeon was fairly certain that it is his gallbladder. They found some proteins in his blood work that is only found in the ducts of the gallbladder. The recommendation was that he have it out. She did inform him he was quite the puzzle. She doesn't realize that is the way my husband likes to do things....never uncomplicated. His surgery is scheduled for Thursday. He must be at the hospital at 6 a.m. and his surgery is tentatively set for 7:30. He can't have anything to eat or drink after midnight and he must be accompanied by an adult. Certainly, he would have chosen one that is a morning person but instead he gets me. Miss non communicate until she's had her second cup of coffee and definitely not before 10 a.m. I suppose I can make an exception this one time but only for him. It's one of the 'perks' that I give out only to a privileged few. If you think about us in the next 24 hours, I wouldn't mind if you prayed for us. I'm a bit on edge and he's a little nervous. I've had several people comment on the quantity of hardships our family has had to endure recently. My brother, even wanted to know how I was doing and if I had any thoughts or revelations through this 'season' we are living. Of course, I began to analyze it and this is what of come up with. There is nothing more important then your faith and trust in God and your obedience to Him. It is so very important to deepen that faith which is your root system that will hold you up through life's trials. If you don't have that, every little bump you come across in your life will send you toppled over. When things appear to be running smoothly, I encourage you to not let that opportunity run by but to communicate with God, ask him to help grow your faith. Then when life's trials come, you will be well equipped to handle the strong winds. A very dear friend of mine asked me recently if I ever got angry at God. I won't lie to you or put on any front. My honest answer is yes. I've even had times when I got quite cynical. While I was going through it, I even felt guilty that I could even feel that way towards God. Think about it this way. When something or someone makes you so angry, it rises up and out it comes before you even have a chance to realize what is happening. I think that God is very familiar with anger. I also think that it's just fine to feel that way...for a time. What makes it wrong is when we seep in it and refuse to move away from it. Anger is another emotion that is part of the equation to working through or coming to terms with something. You don't want to seep in it because that is when bitterness begins. I never want my heart to be bitter or hardened towards anything or anybody but I do want to acknowledge that it's there and I've felt it. My other thought on this is that even though these 'trials' are overwhelming at times and stretch the very fibers of my sanity, I'm in awe as I see all the ways God uses each situation. I'm very thankful that he loves me enough to want me to grow closer to him, to lean on him and to learn more of him. I don't really learn as much when things are smooth sailing...but give me something difficult to tackle and I learn more about who God is and more about his traits during that time than I would in a lifetime of tulips, butterflies and rainbows. I also look back and see how he's strategical placed his people around me to hold me up when I'm feeling at the end of my rope. He will never give us more than we can handle. Often times, I would like to know if I'm getting close to that fine line but I will just have to leave that in his hands. God takes the situation that you've endured and turns it around for you to minister and empathize with someone else whose experiencing something similar. I absolutely love it when I have the opportunity to be used by him to hold someone else up. How honored I feel that God would be able to use me in that way. My conclusion is that the 'big' traumas that we experience help us to get the 'main' thing God is trying to teach us and these 'smaller' but still traumatic experiences are just refresher courses. I figure, when the time comes for me to leave this earth, I should have enough credits to get my doctorate! If you haven't heard already...we've had yet another crisis to contend with. I recently took my husband to the emergency room with severe abdominal pains. Pain that as he described it, felt like his insides were trying to push their way to the outside. So bad that he could hardly talk or think, if you've ever given birth, I think you can relate. I figured maybe he was having an adverse reaction to the antibiotic that he was taking and they would give him something for that and send us home. But instead, they ran many, many tests trying to figure out if it was his gallbladder, his liver, his heart or his pancreas which led to an overnight stay at the 'Cape Crittenton' in suite 627B. What they found was a mystery. His liver enzymes were highly elevated putting his liver in distress. However, they aren't positively sure why that could be. One doctor says he was having a very rare reaction to the antibiotic shot, Rocephin, that he received the day before in the doctors office for his bronchitis. They told him to not get that shot again. Another doctor said it could have been some spinach he ate that night or even perhaps could be a virus. After taking more blood and finding that his liver enzymes were indeed coming down, although very slowly, they felt confident that they would continue in that direction and released him to go home. He had to get more blood drawn this week and is waiting to hear what the results are when he goes in for his appointment next week. He remains very tired and sore which can be discouraging when you want to be back to health very quickly and when the demands of life, job and family want you doing just what you were when you dropped off the line for a second to find out what was making you feel so awfully bad, can be a bit discouraging when all you want to do is take a moment to rest. People are going to start wondering if my life is for 'real'. Do normal people have this many crises going on in their life? I wonder this myself sometimes. The answer is..yes! This is really happening to us. I tried waking myself up but then I realized I never did go to sleep. I know this is possible because I'm up more than I'm down and if there should ever be a night when I get a whole span of 6-8 hours in a row, I'm checking to see if everyone is breathing!